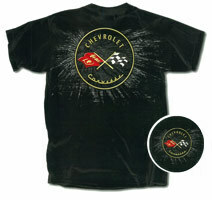 Highly detailed large artwork of the C1 Chevrolet Corvette ‘Racing Crossed Flags” badge emblem, as shown above on the back of the Tee. Highly Detailed smaller artwork detail of the C1 Chevrolet Corvette ‘Crossed Flags” badge emblem and the CORVETTE script in gold leaf effect on the front left of chest, in accurate factory detail and colour. The main artwork of the large C1 Corvette Crossed Flags in large bright high gloss appearance artwork detail is period correct. The background effect is of “shattered” appearance, as used on the smaller artwork of the Tee at the front. The lower script ‘CORVETTE’ is in of highly polished gold leaf appearance.